My latest post over at Middleweb is about using poetry to bring my students on a listening field trip across the United States. The vehicle is their imagination. My latest post at my blog over at Middleweb is a look at a wonderful collection of graphic stories, with connections across science, history, media and more. The collection is called Reading with Pictures and is curated for classrooms. I recently wrote a piece for my Working Draft blog over at Middleweb about using a fun, new way to get my students to write stories. Storyteller Cards. They’re pretty nifty and strange, and perfect for sparking interest from my young writers. At the time, I had just introduced the cards to some students, and asked them for suggestions. Each card has information: a character in a setting, with an object, doing something. Other bits of information along the edges of the cards include a mood, a season, a letter and a playing card suit/number. This is an image from the Storyteller Card site: An Anatomy of a Card. Yesterday, I pulled out the deck of cards for all four of my classes and we created a story-writing game of sorts that engaged my sixth graders so much, they were leaving the class asking when we could write again. Everyone gets two cards, face down. No looking. We all flip one card together, spend a few minutes examining it (lots of excitement when this happened), and begin a short story with that character and some information from the card. We write for 7 to 10 minutes. Keep writing. Write for another 10 minutes. Ideally, the third step of this “game” would have been to trade your card with someone next to you, but we never got there. This activity engaged my students and also provided a nice creative break from our Parts of Speech unit and open response prep work that we are doing as we eye our state tests on the horizon. What if the state test was all about this kind of writing? My latest post at Middleweb comes on the heels of completing a course on ELL Immersion. 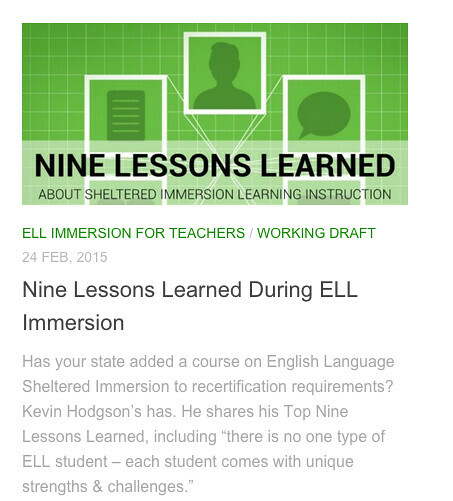 Our state now requires the sheltered immersion course as a requirement for re-certification. It was a bear of a course, and I share out Nine Lessons Learned. My latest blog post over at Middleweb is about the feeling that there is always so much more to learn about the teaching of writing, and how I am inspired by an urban school where I am facilitating a year-long professional development inquiry around writing in the content areas. My latest post at my Working Draft blog at MiddleWeb is a look at play, with Kevin Cordi’s new book as my guide. Come check out the post and think about how you play with stories in your classroom. 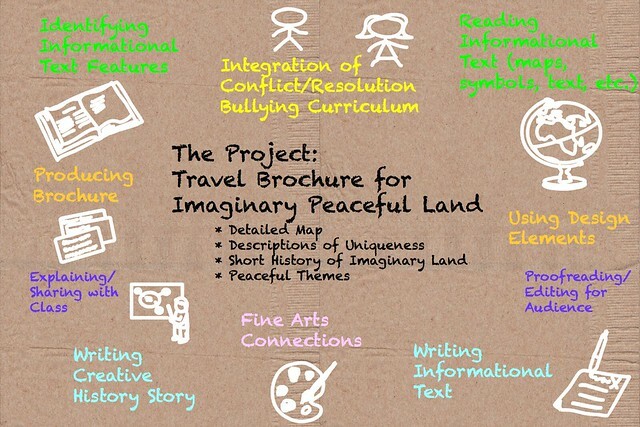 I did not share the above graphic there, but I had worked on this image as I was thinking through all of the literacy points with the project as a way to document the student learning. As I added more and more elements, I realized just how expansive this one project can be, and on how many points of writing, reading, listening and speaking it hits. At my Working Draft blog over at MiddleWeb, my latest post is about our whitewater rafting trip and the idea of seeing our students in a very different environment (literally/figuratively) when we take them outside of our traditional classroom setting. My recent blog post over at Middleweb is about having students make Six Word Memoirs, using comics as the art element. It was one of those extension activities that took on a life of its own. Read my piece over at Middleweb.